Cormach Evans (far right, back) with the rest of this year's Launchvic Indigenous program grant recipients. Photo provided by Launchvic. Victorian entrepreneur Cormach Evans credits a childhood of mentoring from leaders in the local surfing scene for his continued success in the business world. For the self-motivated businessman, success has now reached a new level. 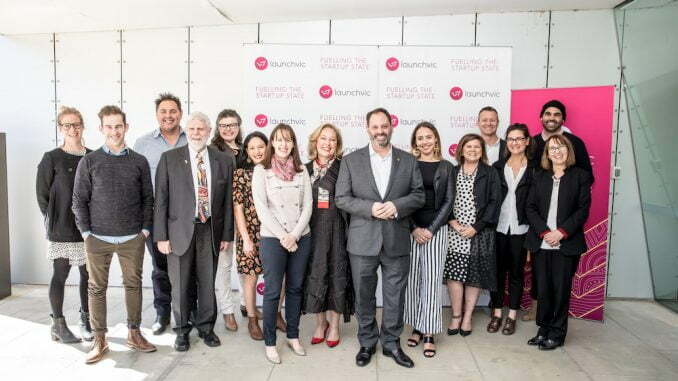 Evans and his two business partners Coco Eke and Shol Blustein have been granted half a million dollars from Launchvic to support Indigenous entrepreneurs. Evans grew up taking part in a surf program run by Surfing Victoria, in conjunction with Indigenous leaders, around the state. The time spent in the ocean and in the surf industry, helped to keep a young Evans grounded and, more tangibly, gave him connections in surf retail. He met a group of people from Torquay-based surf store Strapper. “They invested a lot in me and they offered me a traineeship,” he said. “I worked at Strapper for around 5 years, ran a heap of areas for Strapper, and did a lot of programs as a leader for Surfing Vic. And that led me to creating two Aboriginal-owned businesses,” Evans said. Evans used that experience to start Strong Brother, Strong Sister (SBSS) a mentoring program for Indigenous kids. Blustein helped Evans grow SBSS in his incubator program called Impact Co. The pair spoke about launching a joint venture over coffee during this time together. They joined forces with Evans’ partner Eke, a success in her own right with Bad Apples Music, a record label supporting Indigenous artists. Together they have successfully secured $492 000 from Launchvic with their new organisation, Ngarrimili, meaning ‘to dance’ in Wadawurrung. The company will work with entrepreneurs at the earliest stage of business development to accelerate and nurture their ideas. The team hopes to fill a gap in the business incubator industry. Evans said there are a lot of organisations helping entrepreneurs with established or well-developed business ideas, but there’s not a lot of support at the ground floor. “There’s a lot of organisations out there that aren’t specifically focused on Aboriginal people. We’ve realised we really need to focus on the very start of the venture,” Evans said. Ngarrimili will provide a variety of services and support but will largely focus on supporting Indigenous entrepreneurs who don’t have the skills or knowledge to take the leap out of their day jobs. The organisation is already helping people, Evans said. Years of research went into the concept for Ngarrimili and Evans is confident the service will provide important support to Indigenous leaders across the country. “There’s so many Aboriginal and Torres Strait Islander entrepreneurs out there. We’ve been entrepreneurs for thousands of years, and now we have this amazing opportunity to continue that culture,” Evans said. Ngarramili officially launches this week after recently receiving confirmation about the grant.